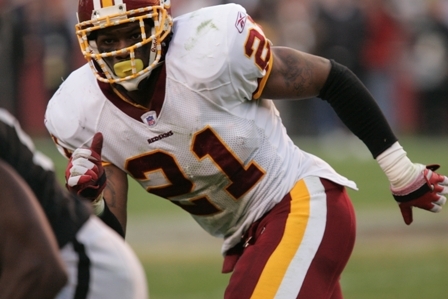 One of my favorite football players ever was Sean Taylor. As a Miami Hurricane and a football fan how can you not like the guy. He was absolutely amazing on the field and devastatingly sad that he is no longer with us. With four more helmets remaining to have at least one helmet representing all 32 teams (three more if you count the Oilers as the Titans), I knew when I did a Redskins helmet I would want to do a Sean Taylor inspired helmet. I tried to make it as close to the real deal as I could, but it is a different shell and minus the accessories (and tape) that Sean used on his game helmets. It turned out pretty good and the Krylon Burgundy turned out ot be a pretty good match. As with all my helmets I go for a glossy smooth mirror finish. To accomplish this takes a few tools of the trade and some good ol’ fashion elbow grease. Once you have your shell all painted, or if you are trying to rehab a shell you have that is already painted, you can use this technique to get that ultra-smooth mirror finish. The first thing you will have to do is wet sand the shell you painted. I recommend waiting at least a couple days after you clear coat the shell to wet sand. Just to make sure the paint has properly cured. I use a technique that is normally used for cars, but it works just as well for helmets and can make plain old spray paint from a rattle can look pretty close to a professional finish. Now, you can start out with any high grit sandpaper and work your way up. I usually just go with the 3000 grit sanding sponge and call it a day, but is totally up to you and how much work you want to put into it. You also don’t want to go too crazy and actually start removing clear coat or paint and ruining your work. I use the 3000 grit sponge and lightly sand (very little pressure) the entire shell for 10-15 minutes or until the paint feels nice and smooth. At this point when the helmet dries, it will be a bit cloudy. This is okay, but if you want to sand some more, be my guest. Once I am happy with the wet sanding job, I move on to the glaze and buff step. At first I just polished the shells, but unhappy with the finish I took this extra step. You can find the glaze at any auto parts store. I coat the helmet with the glaze and then use a buffing attachment on my cordless drill, making sure to lightly buff the entire shell. The final step is applying polish and hand buffing the shell. I use Mother’s plastic polish which works really well for this, but you can use any kind of car wax or polish you might have for the final polish. adding the polish won’t impact your decals so you can get the shell polished before you apply decals. For polish you will apply, let it cloud and then rub off. The more you rub the shinier it will get. At this point you can apply the decals. Depending on the quality of decals, it can be difficult to avoid bubbles or pinching. This is where your trusty hair dryer comes in. I have one specifically for my shop, but you can borrow one from your significant other, sister or neighbor. On high heat use the dryer on the decals. This will one, make the decal softer and less prone to pinching and bubbling. Making it far easier to apply. Secondly and this is especially important if you are applying old decals or ones re-applying some decals that started to come up, it will make the glue tacky again, giving a better seal. The dryer can also be used to remove decals. Once you are happy with the decal placement blow dry the entire shell one more time to seal the glue. Once that is done, time for a final polish. For this polish step you can once again use plastic polish or if you like a high end wax. NFL teams have been known to use floor wax over the years. Furniture polish is another great way to get the helmet to shine and is great for cleaning and dusting your helmet after it has been displayed for a while. Damn, I forgot My Balls! When I posted about my team colored wood MLB logos, I failed to notice that I hadn’t glued the balls onto the logo. The batter was swinging at nothing! I added them and they now look bette and are displayed on my TV stand. if you are looking for any sort of custom wood logo, let me know. The Redskins have had some great helmets over the years. While their nickname may be controversial the helmet is a bit more dignified than say Chief wahoo. Anyhow, over the years the Redskins have had some great helmets like the early feather helmet which had a single large feather on the top of the helmet. This was worn from 1959-1964. In 1965 the team switched to the spear logo, while the burgundy helmet remained. The spear helmet was used from 1965-1969. In 1970, as I have previously talked about, the Redskins switched to a Green Bay gold/yellow helmet upon the request of then head coach Vince Lombardi, who died before the helmets were worn on the field. They would only wear this helmet for two seasons. Starting in 1972 the team switched to what essentially is the logo we know today. With minor changes to the color of the ring and the skin color. First with the gray mask from 1972-1977 and then a yellow mask from 1978-today. I love the yellow mask. They have worn that helmet ever since with the exception of throwbacks and the tucked feather of 1982. The tucked feather was to make the application of the decals easier and according to helmet hut, was changed back the following year when more flexible decals were found.